Some of the people who read this article will not like it. It may upset them or disrupt their status quo. But as the old saying goes, “Often, it is easier to tell people what they want to hear than what they need to know.” In my over 37 years of involvement in Jeet Kune Do, it seems that at certain times it becomes necessary to educate (or in some cases, re-educate) people with regard to the true nature of Jeet Kune Do. Every few years some new phraseology pops up on the JKD scene. Some new prefix or suffix is attached to the name Jeet Kune Do (which usually ends up being little more than an attempt by a person or group to carve out a niche for themselves in the burgeoning JKD market, and support their own agenda). Throughout the years we have seen terms such as “Original JKD”, “JKD Concepts”, “Chinatown JKD”, Old School JKD”, “Functional JKD”, “Pure JKD”, “True JKD”, and “Contemporary JKD” become part of the JKD world. My concern is not with the names put forth by any individuals or groups. My concern is with the misperceptions concerning JKD that continue to flourish as a result of material that is put forth concerning the art. To comprehend the true nature of JKD, one has to first understand the “root” of the art. The root of Jeet Kune Do was not, as many believe, Wing Chun Gung Fu. While Wing Chun may have served as a launching platform for Lee’s martial endeavors, it was merely the first martial art Lee studied in depth. The “root” of Jeet Kune Do was Bruce Lee himself. It was what lay between Bruce Lee’s ears that made him so good. It was his mind and his thought processes that allowed him to actualize his potential as a martial artist. Lee’s way of thinking directed him to search for the fundamental truth or “essence” underlying efficient human movement in combat. And when he did, he looked to science rather than tradition, to “motion” rather than “style”; spending thousands of hours training, researching and investigating various forms of martial arts as well as human anatomy, physiology, kinesiology and physics. Lee was interested in what made for a more efficient kick or punch, not where it came from. According to Dan Inosanto, Lee used to tell him, “Dan, if you understand it and can use it, it belongs to no one; it’s yours.” And if Lee absorbed something into his structure, it simply became a part of his personal combative arsenal. Since its creation, Jeet Kune Do has always been about “totality.” Yet the latest element to be put forth for inclusion in JKD is the use of certain techniques and tactics that are considered “dirty” or “filthy” in order to make the art more up-to-date and more combat-effective. These techniques and tactics include such things as biting, eye gouging, pinching, etc. The message (and misperception) that is being presented to the martial art public is that these elements did not exist in JKD before they were added in by these people. This is a fallacy. # Let “body feel” on the forearm as a destructive weapon (use as loose club snap or club) alongside with elbowing. I have included more of Lee’s notes regarding pinching, biting and eye gouging, etc. so that the reader can get a better sense of the actual “totality in combat” that Lee was striving for. It is clear to see that the so-called ‘latest” or “new” JKD techniques (as well as numerous other so-called “dirty” techniques) were listed as part of Lee’s combative arsenal over forty years ago. 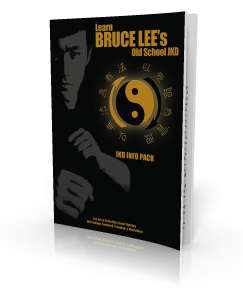 The fact that individuals may not have been aware that such material or techniques existed in JKD or was part of the totality of JKD may be due in part to the fact that much of Lee’s written material was not accessible to the public, including many JKD practitioners, until the Bruce Lee Library Series was published in the late 1990’s. Because many of these things were listed in Lee’s journal as personal “investigations”, they were not included as part of the general JKD curriculum which was taught in the classes. However, knowledge of them was made known to me as well as other JKD practitioners who trained under Dan Inosanto as far back as the early 1970’s. For example, on numerous occasions Dan discussed Lee’s incredible forearm and grip strength and his use of pinching and grabbing an opponent. This was not done from the perspective of a “JKD pinch” or a “Filipino Kali pinch”, or a “whatever pinch”, but simply from the perspective of “pinching.” Did we ever have a class on various schools of pinching? No. If you look at the book “Jun Fan/Jeet Kune Do — The Textbook”, which was written by Tim Tackett and myself in 1988, you will find actions such as biting, pinching, eye gouging listed as dirty fighting under the basic elements of attack. So my question is, what part of the “totality” of JKD do people still not get? Furthermore, how do you evolve totality? The answer is that you can’t. You may be able to improve your own knowledge and understanding of elements within it, but if something is “omni” or “all”, you can’t get beyond that. It’s like trying to go beyond 100%. Let’s attempt to deal, once and for all, with the issue of “styles” as they relate to Jeet Kune Do. Oftentimes, when I am with someone who is observing a JKD training session, depending upon what they are watching, I hear comments such as, “He’s doing Wing Chun” — “He’s doing Thai Boxing” — “He’s doing Brazilian Jiu Jitsu”, etc. The problem is that the people who make these comments are still hung up on “styles” and labeling what they see as being from “this” style or “that” style. They are locked into categorizing and labeling everything they see, even down to the current label du jour, “He’s doing MMA.” When it comes to JKD, an individual expresses themselves using whatever technique or action they choose to use at the moment. At times what they do may resemble Thai Boxing or Savate, at other times it might look like Wing Chun Gung Fu or Ju Jitsu, etc. Self-expression doesn’t mean that everyone will look totally different or move in a completely different way. That’s impossible in any endeavor or activity. Similarities will always appear because efficient human movement in combat is just that, moving efficiently. If a person takes the time and puts forth the energy to read any of Lee’s written material, or listen to any of his audio and video interviews, they will get a very clear understanding of what his view was concerning the idea or notion of “styles.” At the time preceding his death, Lee viewed styles as “cages” or “chains.” A person might be able to move about in a cage or while wearing a set of chains, but they would be restricted nonetheless. Oftentimes, when I am discussing Jeet Kune Do, someone will ask the question, “JKD, …isn’t that just mixed martial arts?” My response to them is, “To the unknowledgeable observer that may appear to be the case, but no it isn’t.” A lot of people today tend to confuse JKD with what is now referred to as “Mixed Martial Arts”, and it is easy to understand the reason for this. JKD is considered by many to be the “original mixed martial art” because it seeks totality in personal combat considering all ranges and aspects of fighting. However, while some similarities exist between the two, they are not the same thing. While MMA may have adopted some of the principles that exist in JKD, such as being able to function in the various ranges and aspects of fighting, there are however, some major differences between JKD and MMA. On the most fundamental level there are rules in MMA. It is a competitive combat “sport”, and as such, the rules and regulations dictate the direction of training. There are, for example, numerous actions that are considered “fouls” in MMA competition that are exactly the type of action a JKD practitioner might use in a self-defense situation, such as kicking the knee, kicking, punching or grabbing the groin, pulling the hair, poking the eyes, finger locks, etc. JKD is about combat “as it is.” Another difference is that, as was discussed above with regard to styles, JKD views martial art as a single unitary whole, in its “totality” as opposed to various separated segments such as kicking, striking, grappling, etc., or ‘this’ art and ‘that’ art combined. This in no way denigrates Mixed Martial Arts or its practitioners. Some of the best martial artists in the world today are involved in the sport. Finally, you will understand that Jeet Kune Do is about you, the individual. It is about you cultivating your own body as a martial instrument and then expressing that instrument with the highest degree of efficiency and effectiveness and with total freedom.